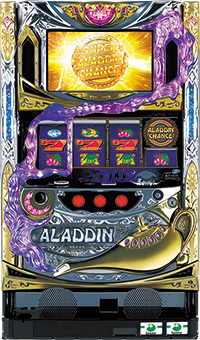 Today, we will introduce “Aladdin AⅡ”, a pachislot machine with the theme of “Arabian Nights”!! This is the succession machine of the legendary pachislot “Aladdin A”, which was a megahit 10 years ago. Although it used to use pixel graphics as animation, it transformed into a 3D computer graphics with cute characters. However, the pixel graphics is still used in the new version as high-expectance animation!! Jackpot is not at all inferior compared to the legend 10 years ago!! “Aladdin AⅡ” has just been introduced to the parlor this week! !Better rush to the parlor right now! !